These are just some of the things artists and writers have explored for generations through the world of comics. Comic art is one of the most popular story-telling mediums around the globe — from comic strips to Manga, from humorous teen ankhs to social commentary. Now, more than ever, students can be part of that magic! Simmons and many other artist are willing to share their skills and enthusiasm for the medium through creating comics workshops. In this exciting workshop, students are introduced to the process of creating comics — from idea, to script, to full color art. They practice figure drawing, and with the help of instructor like Alex Simmons, and other comic industry professional, students will experience the process of creating their own comic strips and full-length stories (developing plots, penciling and inking the pages, etc.). 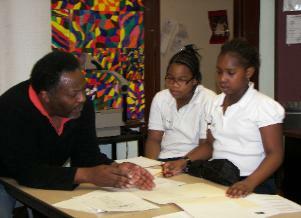 Simmons has been teaching his Art of Making Comics Workshop in schools, libraires, and community centers for many years. 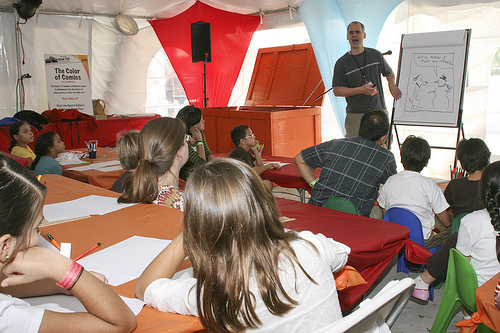 As the founder of the annual KIDS’ COMIC CON, Simmons made certain that this all ages event offered numerous creative workshops taught by professional artists. 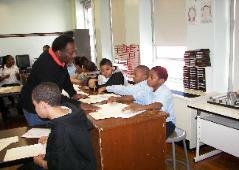 And in 2008 Simmons introduced his Sci-Tech Heroes Workshop (to students and teachers) geared to using comics to engage young people in the excitement and wonder of science and technology.